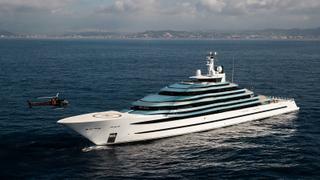 The 110 metre motor yacht Jubilee, listed for sale by Burgess, has been sold to a direct client. Built in steel and aluminium by Dutch yard Oceanco to a design by Igor Lobanov, Jubilee was delivered in 2017 as the largest yacht built in The Netherlands. A huge volume interior by Sam Sorgiovanni accommodates 30 guests in 15 cabins. Four VIP cabins are found on the bridge deck, while there are a further 10 guest suites on the main deck. In addition, she boasts an entirely private owner’s deck that enjoys unmatched views. The main saloon is a huge, open 135 square metre space focused around a large television at one end and a throne-like lounge chair at the other, sitting underneath a ceiling covered in golden aluminium ribbons. Floors throughout float on rubber foundations to dampen noise. Sea balconies on both sides of the main deck - at the dining saloon and lounge bar - open the expansive interior to the outdoors. Features include the tremendous pool deck with a built-in aquarium. Just below is an inviting beach club - which also hosts a gym and hammam - and access to the water via a fold-down transom. Her top speed is 18.5 knots and she boasts a maximum cruising range of 5,000 nautical miles at 14 knots with power coming from two 4,828hp MTU diesel engines. The asking price of Jubilee has been withheld.